No, Obi-Won, it wasn’t screams of terror, it was screams of delight. 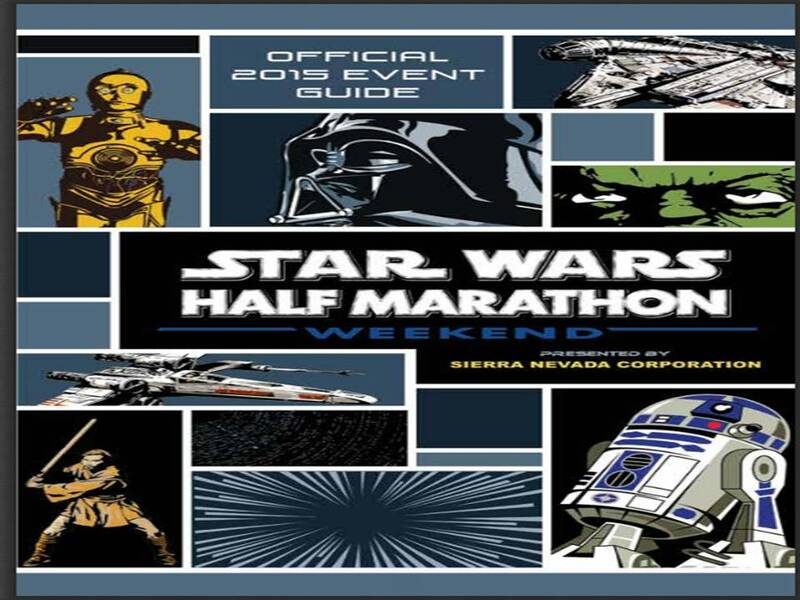 The Star Wars Half Marathon Weekend Official Event Guide is officially online. It can be viewed here. 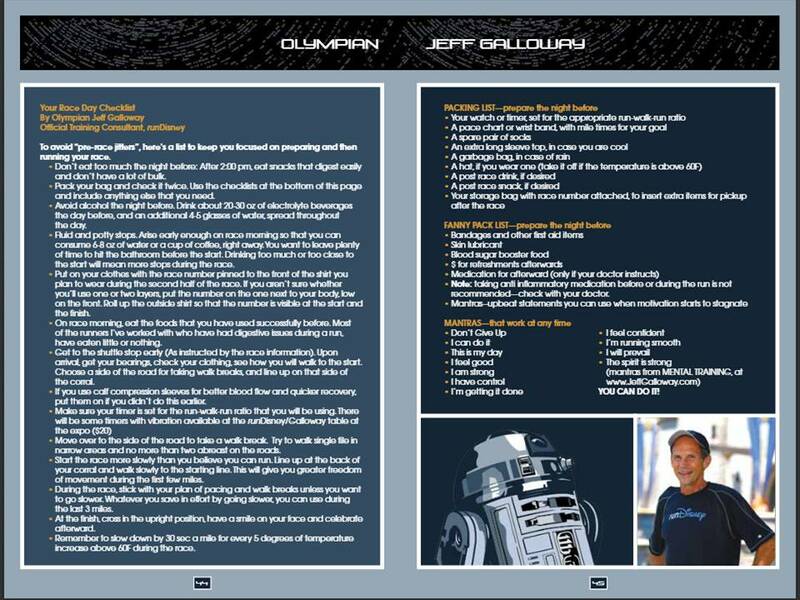 I love this race guide! The inner Star Wars geek in me can hardly contain my joy! 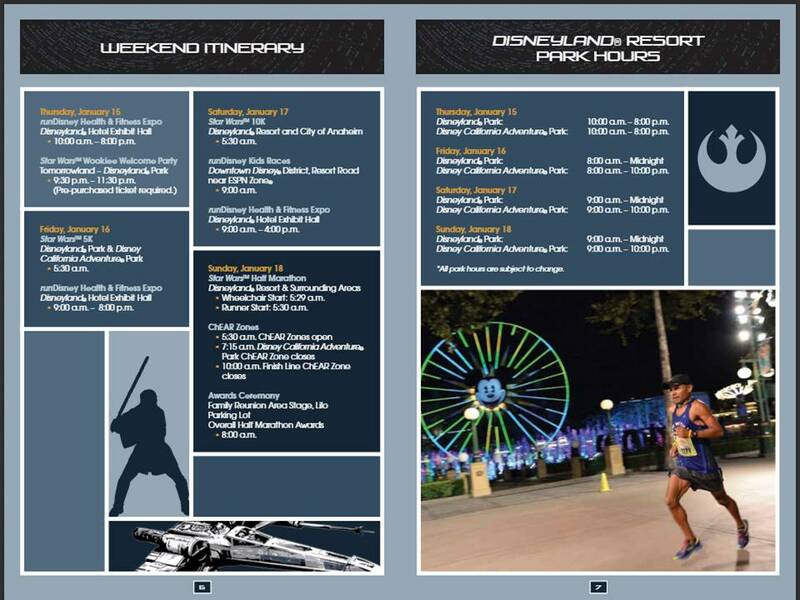 Much like the event guide for the Avengers Super Heroes Half Marathon, the folks at runDisney have created a really fun guide for us. Like I’ve done with the event guides in the past, I’m going to pull out some highlights for y’all to check out. First off, how cool are the first pages! I absolutely love the space program. 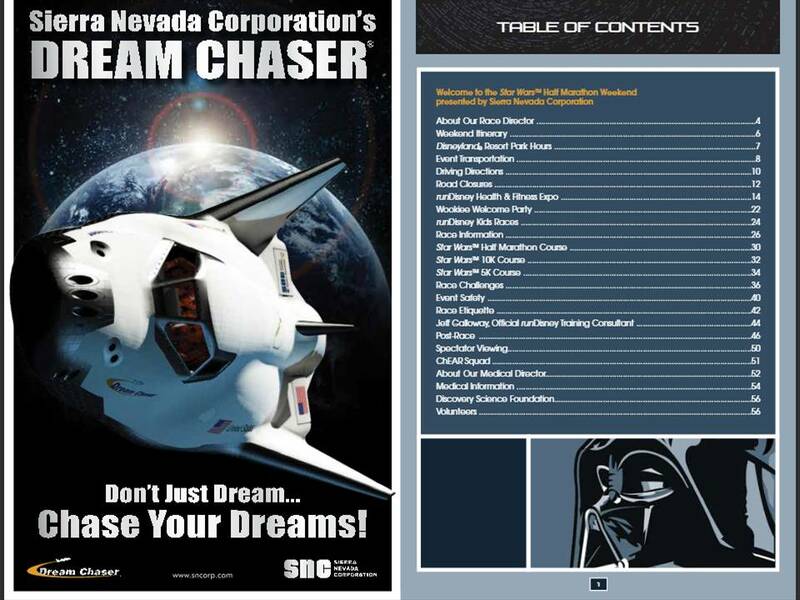 So, having a space shuttle with “Don’t Just Dream…Chase Your Dreams! is perfect! What a great way to open this guide of a half marathon weekend! We all should pay attention to the weekend itinerary. As you make your final preparations for race weekend, you’ll want to know when everything is going to happen. 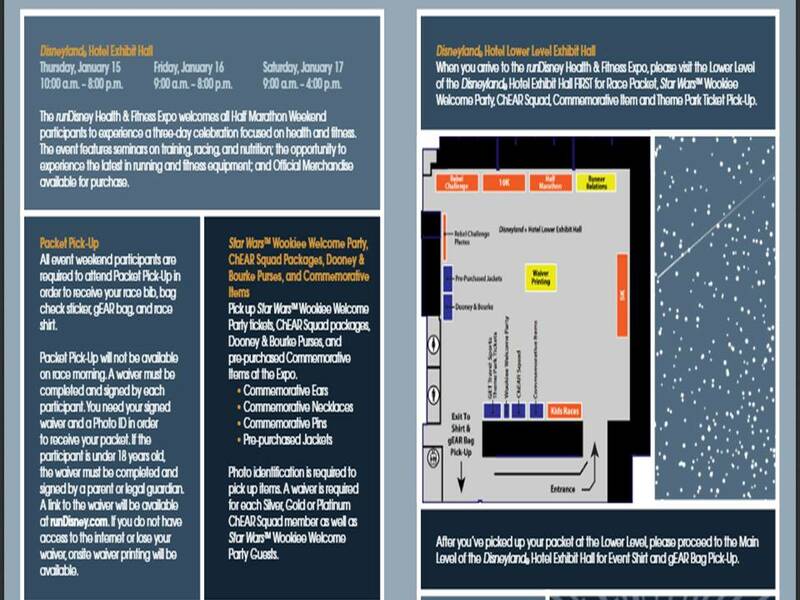 One of the more important items for those who want race merchandise is that the expo opens at 10am on Thursday, January 15th. You should plan on being there no later than 10am if you want the best selection of official race merchandise. I heard complaints during the Avengers Super Heroes Half Marathon Expo from those that arrived in the afternoon to find their one item they wanted out of stock. Don’t be that person. If you want official race merchandise, be there by the opening or realize you might not get the items you set your heart on purchasing. Some folks won’t care about this. If that’s you, then don’t rush. If I had no desire to purchase official race merchandise, I’d arrive later in the afternoon when the crowds die down. The choice is yours. If you’re arriving in the mid afternoon, just keep in mind that you might not find a large selection. If you’re not staying at a Disney run resort hotel, this page is important for your planning. 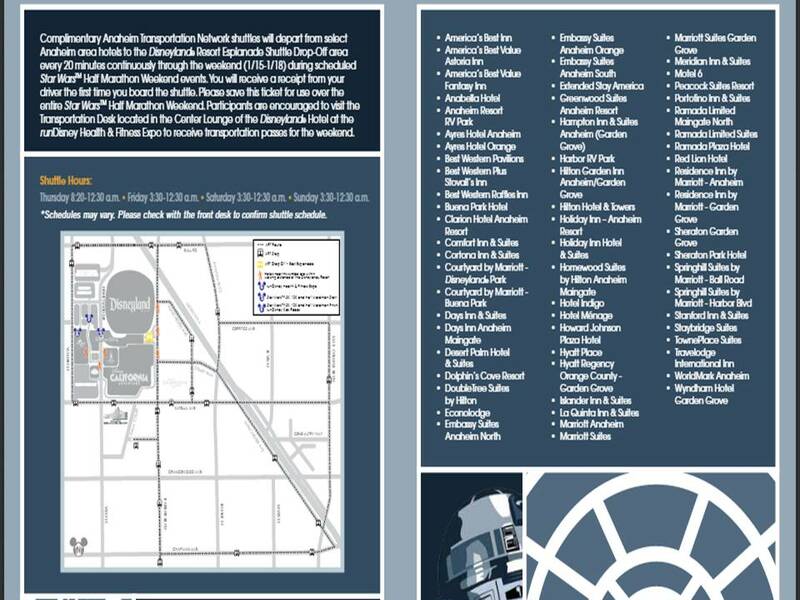 Above, you’ll find a list of hotels that offer a FREE shuttle to the Disneyland Resort for you during race weekend. Those shuttles do run early for the runners. 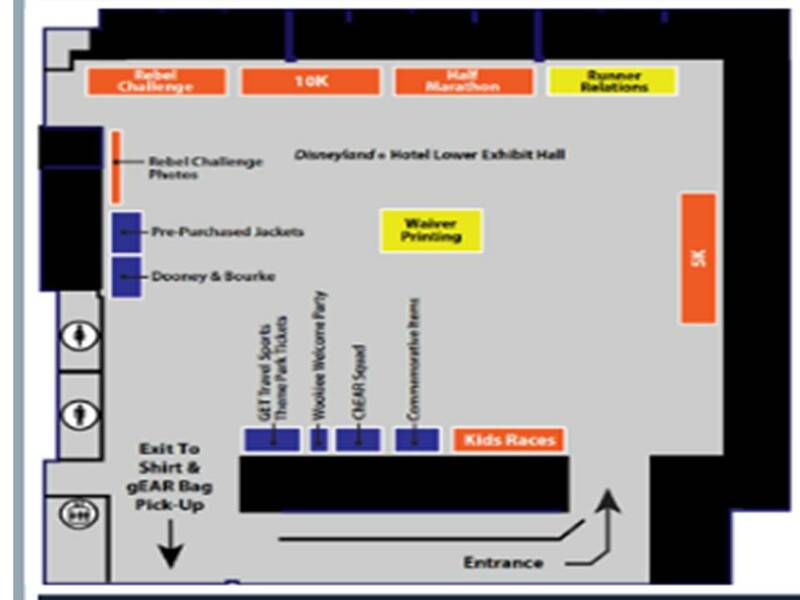 The Expo will be held at the Disneyland Hotel Convention Center. Packet pick up is down stairs, below the exhibit hall for the main expo. The guide suggests getting your race packet first. If you want official race merchandise, I suggest going to the official merchandise area first. The runDisney races do not run out of shirt sizes. They do run out of official merchandise items. When you go downstairs, this is how the bib pick-up area is laid out. There is plenty of room to get around. Everything is marked very well. So, you might not need this information. However, for the super planners, here you go. 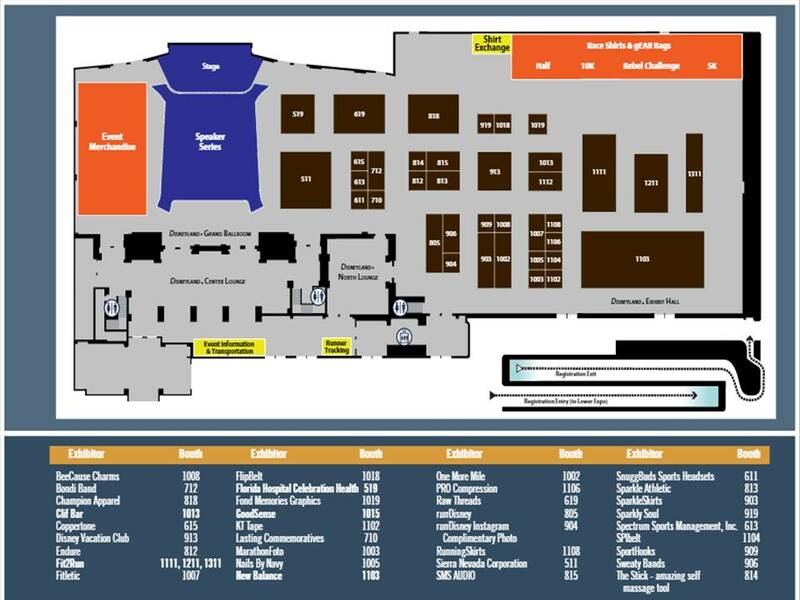 Here’s a map of the main expo floor. It looks like there won’t be any representatives from any of the local races. This kind of makes me sad. I signed up for the Surf City USA Half Marathon at the Avengers Super Heroes Half Marathon Expo and didn’t have to pay any of the Active.com extra fees! So, for you super planners, check the list of vendors and where they will be located. 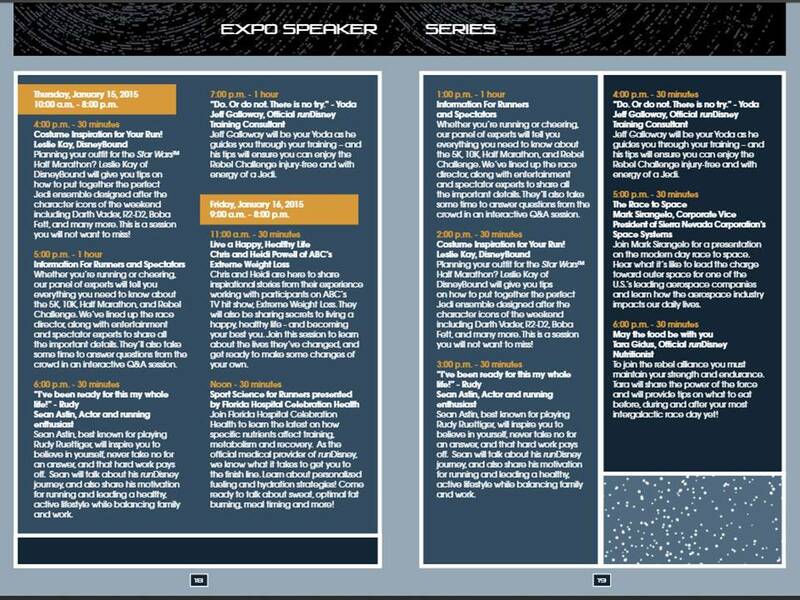 I think the Expo Speaker Series is pretty interesting. Costume Inspiration, presented by Leslie Kay of DisneyBound sounds interesting. Although, I’m not too sure how much it will help with the current race. I might be tempted to take a listen. Sean Astin will be there. So, will Jeff Galloway. As will Tara Guidus. Those are the usual suspects. Chris and Heidi Powell from ABC’s Extreme Weight loss are also presenting. That sounds interesting as well! Sport Science for Runners might be worth your time as well. However, at 5pm on Friday they will have a talk entitled the Race to Space that is something pretty different. Plus, on Saturday at 10am, they will have a talk entitled Out of this World Training presented by Astronaut Steve Lindsey that seems like a must see kind of talk. 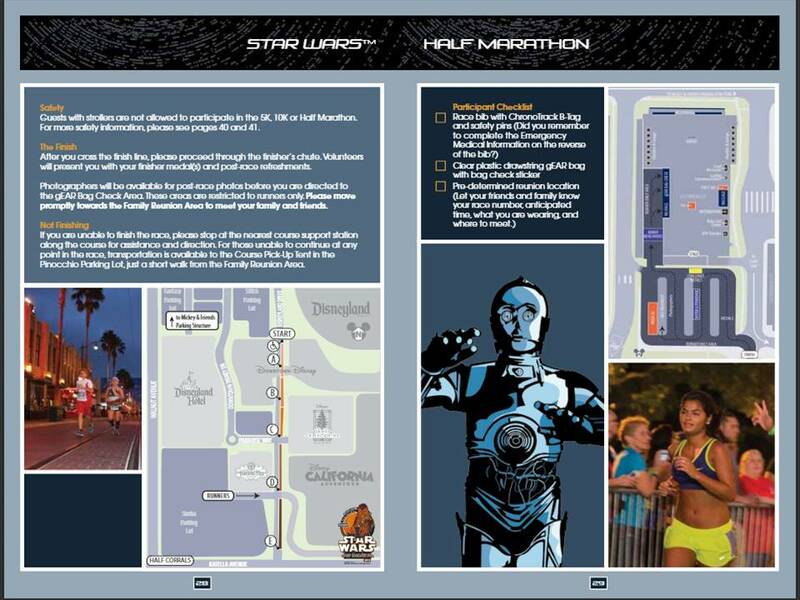 Here’s some information about the Star Wars Half Marathon with a 3 point check list. 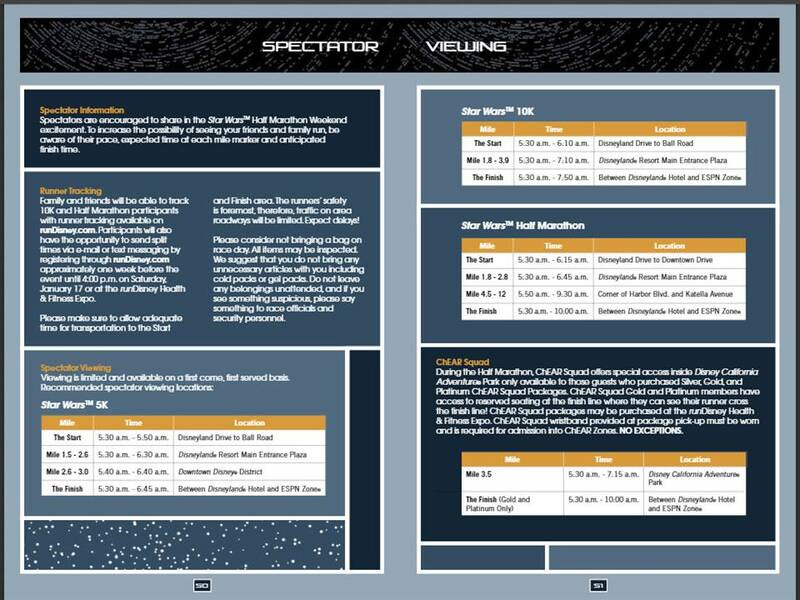 Included in those pages are where the corrals will be and a map of the staging area/family reunion area. 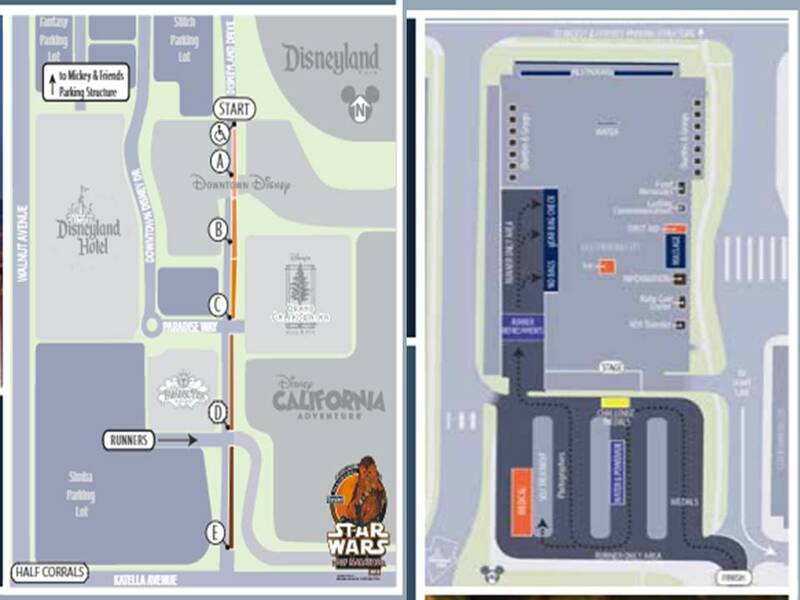 Note that the race heads the opposite way as the Disneyland Half Marathon and the Avengers Super Heroes Half Marathon on Disneyland Drive. I will point out the section on Race Etiquette every time. If you’re a new runner, please look over this area. So many participants will not even look this over. 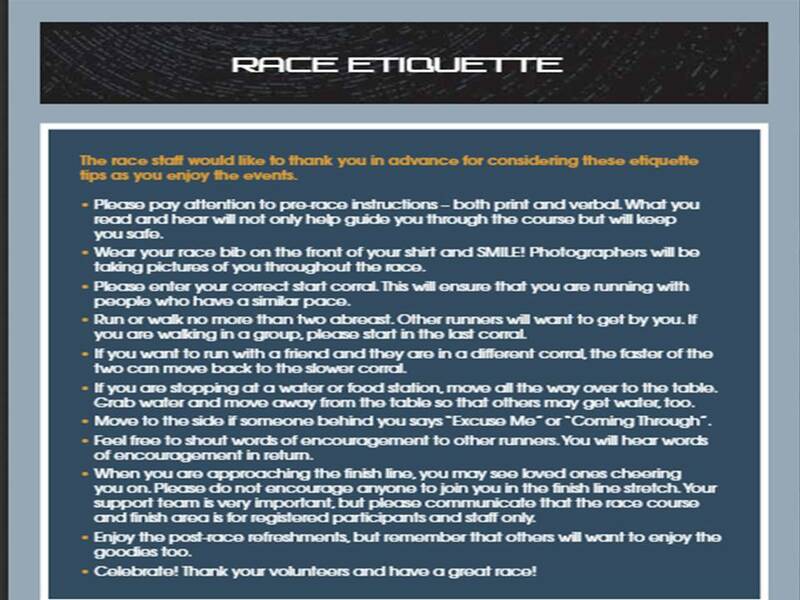 The race announcers have been talking race etiquette before the races lately. So, at least runDisney is trying to get the word out. I point it out in an effort to get the info out there. I really liked this section with Jeff Galloway. Jeff has some great advice for you. I like the two packing lists he’s given. Really good advice! Also, he has some mantras that you might try using as you get into the final weeks of preparation. If you have friends and/or family coming out to cheer you on, this page will be very useful. 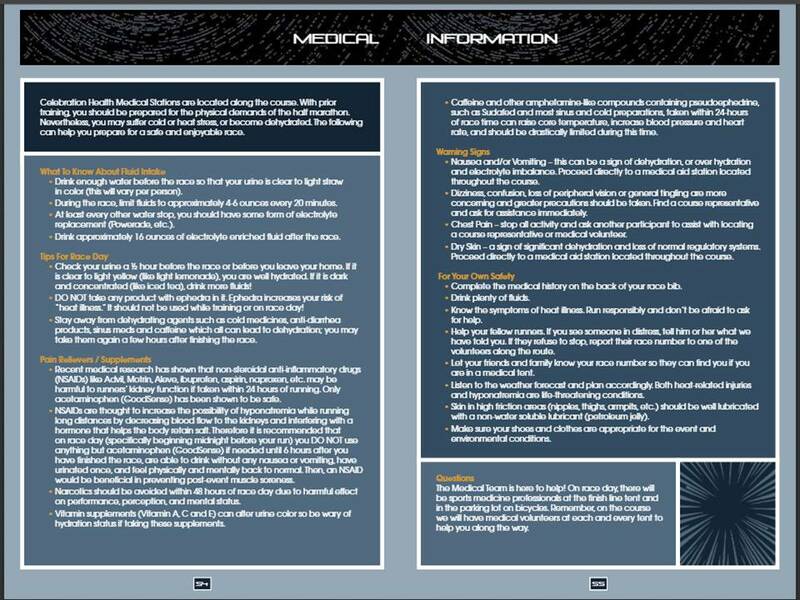 Lastly, I want to highlight the section that talks about medical information. Whether you’re running your first 5K, 10K, Half Marathon, or doing the Rebel Challenge, so much can go wrong in a race. This page might be a life saver for you. Pay attention to how you’re feeling during the race. There are medical peeps at the races. If you need them, do not hesitate to make your way to the medical tents. Don’t be a hero. If your body is giving you signals that it is just not your day, pay attention. There will be other races. Be safe out there. 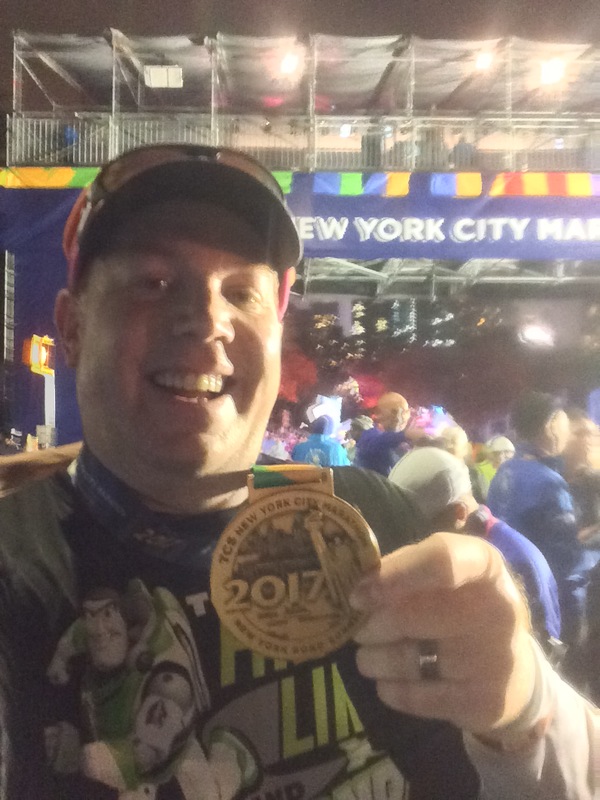 Since I am not running the Star Wars Half Marathon next month in Disneyland, my friend Greg at WhyIRunDisney.com is keeping you up to date on all the happening! I am so so jealous!!!! You could be running this in 2016. 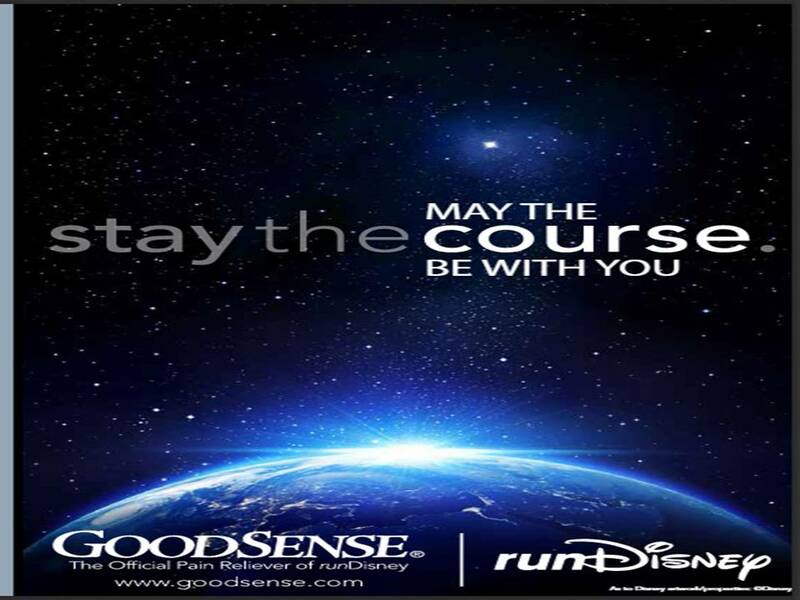 I think the program is one of the best rundisney has put out. It is so much in theme and so cute! I totally agree! It’s been awesome to see what runDisney can do with a race guide when they have a movie (or set of movies) as the theme!